At long last I am going to run a game I have long been wanting to try, which is a one or two session dungeon crawl using the Chainmail combat rules with OD&D books. I am going to allow each player have 100 points to spend on choosing a figure or figures from the Fantasy Combat Supplement of Chainmail. I chose that number to permit the use of the Wizard should anyone want it. However I am going to, this time at least, limit a player to no more than five figures so the adventuring party can fit on the 3D terrain I have built for the scenario. A figure begins play with the number of xp denoted in the OD&D level tables. I will be using the Man to Man combat matrice except with regards creatures on the Fantasy Combat Table, which will be used when fighting them. Damage is one point per strike, adding any bonuses for magical weapons. I will not be using attributes. A hitpoint system will be used, a monsters hit points in this game will be equal to its HD number in OD&D. For players it will be level HD. All spells on the OD&D spell lists are available and have a complexity rating equal the spell level. Clerics work in the same fashion as a Wizard but also have turn undead power. So before I can stock my dungeon, I have to wait for my players to choose thier figures. Only after I see the final point spread of the party and the characters can I build the opposing forces of the dungeon, in that respect it will function as a wargame. I have no idea how this will work, it could be a train wreck but then again, maybe it will be fun! I intend to have plenty of traps, puzzles, tricks and mental challenges as well as roleplaying. I am going to document the turns of the game with pictures. I hope it works, but really it's just an experiment! thanks phf! actually it's easy peezy and this is unfinished. The terrain are those self-adhesive vinyl tiles you buy at the discount store as a linoleum substitute. I cut em up and stuck em on an old game board. I also found you can score the tiles with a razor knife and paint them black and then drybrush on some gray to get a stone look. Will be covering the dark places with water/glue soaked paper towels which will give a relief look when painted black but still lay down flat enough to fold the board up for storage! 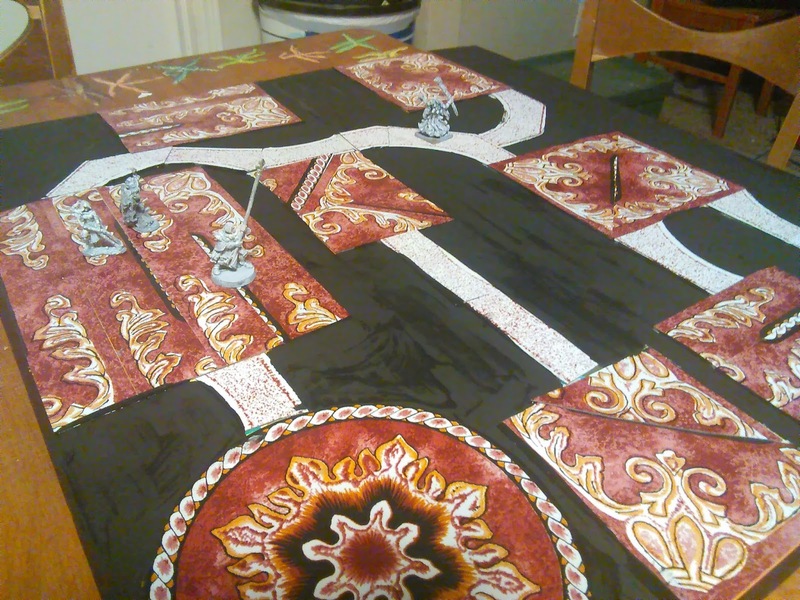 However, I do like the designs on this tiles set and thought about keeping it and telling the players it is a painted mosaic floor...:). Thanks!